Model aircraft for bonding. Size: 1:32; 32.1 cm. Packaging includes: 68 pieces for gluing. Vought Corsair was one of the most unusual but also the most successful naval aircraft of the Second World War. Fear was especially inspired by his Japanese enemies, who nicknamed him "Whispering Death" (literally "Whispering Death"). He made his way across the sky over the Pacific Ocean between 1943 and 1945, and managed to achieve record successes: 2140 downed enemy planes, compared with just 189 losses. 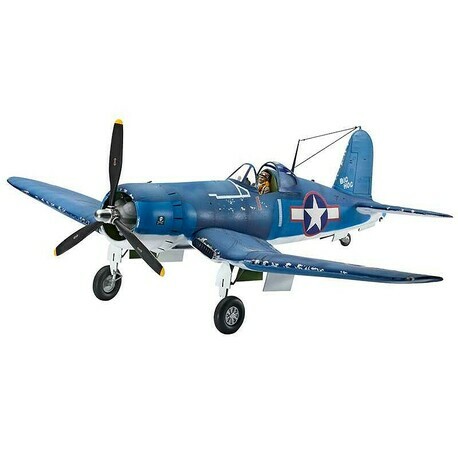 The total firepower of Corsair represented six 12.7 mm Browning machine guns. Its characteristic curved wings became a unique landmark for ground units, for which they called it "Sweetheart of Okinawa" (Okinawa vale). The F4U-1A was the first production series with a whole range of modifications. Maximum speed 671km / h (416mph). Recommended for children from 11 years of age. Warning: Risk of suffocation! The product contains small parts. NOT SUITABLE FOR CHILDREN UNDER 3 YEARS"